DLT Linear Thruster Slides are fabricated with precision manufactured shafts and incorporate preloaded linear ball bushing for a robust guided air cylinder with excellent linear motion control. 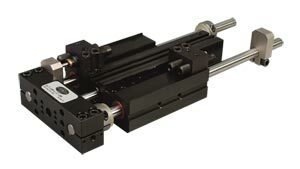 Shock absorbers and precision stop blocks create pneumatic linear motion with extreme accuracy and repeatability. Stroke lengths of 25 to 150 mm (.0984 to 5.906") with a force range from 89 to 275 N (20 to 62 lbs). DLT Thruster Slides, by Robohand, are internally powered to reduce size requirements and can be utilized in many industrial, R&D, lab, production and quality inspection applications from single direction to complex X-Y-Z motion. These pneumatic automation components are used in typical Pick-N-Place applications and can handle small to large objects. Productivity improvements and cost reduction of repetitive task can be automated in some of the following applications: assembly; escapements; in-line directional changes; transfer of objects with precision movements. The modular design, Direct Connect Technology, allows the addition of DRF Rrotary Actuators and pneumatic grippers with out the need of adapter plates for additional savings through fast assembly and reduced machining time. Application Restrictions: Flow controls, shock absorbers and urethane bumpers recommended for nearly all applications. Use composite bushing in dirty or gritty environments. Never use silicone based lubricants with composite bushings. * Higher pressure possible. Consult Sales with application details. ** Addition of lubrication will greatly increase service life. For a better understanding of the DLT Linear Slides and their accessories, use the Specs link at the top of the page to view our PDF. The Product Features or Accessories pages will assist your understanding of the slides and required components. 참고: * Requires universal mounting kit. † Sensor and cable sold separately.